There's just one big compromise. 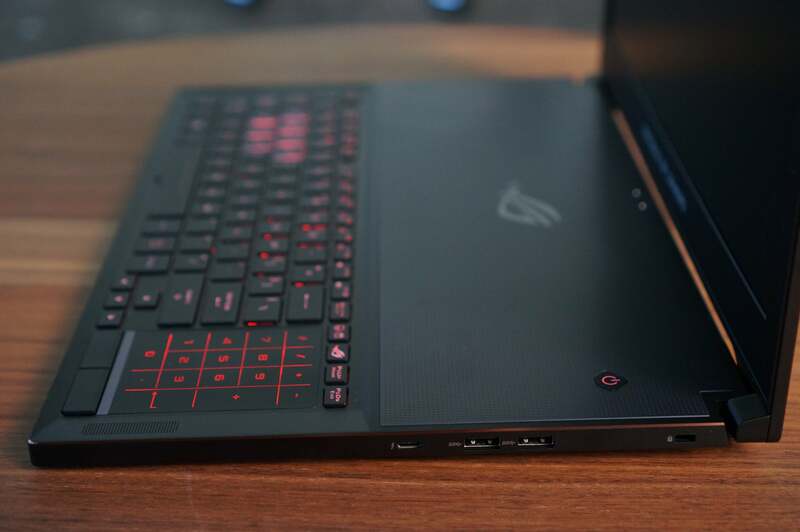 The Asus Republic of Gamers (ROG) Zephyrus GX501 had us at "GTX 1080 graphics in a five-pound laptop that's almost as thin as a MacBook Pro 15." Pound for pound, this is the most powerful portable gaming laptop on earth today. But to get this much performance in a laptop this portable, some big compromises have been made. How thin? That's an Alienware 15 R4 on the left with the Asus ROG Zephyrus GX501 in the middle and a Dell XPS 15 on the right. Inside the GX501 is none other than Intel's 7th gen Core i7-7700HQ. For RAM, Asus equipped our review unit with 24GB of DDR4/2400, but note that U.S. versions will actually max out at 16GB of RAM. The highlight of the GX501 is the GPU: Nvidia's GeForce GTX 1080 with Max-Q technology. Max-Q technology, which Nvidia introduced at Computex, is made to wring more performance out of its laptop GPUs with less heat and power output, thanks to careful software and hardware tuning. A GeForce GTX 1080 with Max-Q has a TDP as low as 90 to 110 watts, for instance, while a standard GeForce GTX 1080 can put out up to 150 watts of heat. That's a serious reduction in the heat output (and power consumption). More improvement comes from design features such as a bottom panel that opens up when the lid is opened. This allows more cool air to be sucked into the laptop without impacting port placement. 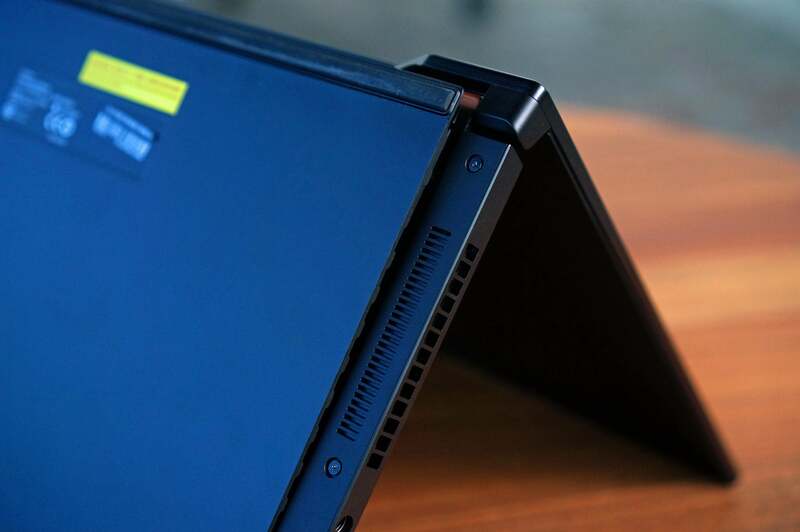 We should mention that as much as some will dismiss the tilt-out bottom as a gimmick, the GX501 is an exceptionally quiet laptop for the amount of performance it packs, even under GPU loads. If WhisperMode (which Nvidia also announced at Computex) makes it into the GX501, it should be even quieter. Asus ROG Zephyrus GX501 features a bottom that pops open to better aid cooling of the GTX 1080 and Core i7-7700HQ inside. You don't just put a GeForce GTX 1080 into an 18mm-thick frame without a compromise, though, and Max-Q imposes a pretty steep one up front: clock speeds. A standard GTX 1080 will typically features a base clock speed of 1,556MHz with a boost clock up to 1,773MHz. A GTX 1080 with Max-Q has a base clock of 1,101MHz to 1,290MHz. Although Max-Q parts give you the same memory interface and CUDA cores, the clock speeds take a big hit depending on the GPU load. Nvidia's boost clocks may just be guidelines, though. We found that under light loads, the GX501 could actually hit the same clocks as a standard GTX 1080. Under far heavier loads, though, the boost topped out below its max at 1,290MHz. It's this variable clock speed that may confuse buyers of Max-Q laptops, as performance will vary too. We'll cover this later in the performance section. The screen itself is 1920x1080, a perfectly good resolution that's looking ho-hum only because of the constant one-upping of display resolutions at the high end—at the cost of performance and battery life, it must be said. The GX501's display is fine for most uses and has decent off-axis viewing, better than what we saw with the Alienware 15 R4's panel. The GX501's brightness disappointed us slightly, though, hitting a maximum of only 284 nits. What's probably important to gamers is the panel's support for G-Sync—and not a yawner 75GHz G-Sync panel, but an eye-catching 120Hz G-sync model. One pain point: The GX501 features just one M.2 slot, so buy the largest SSD option for the GX501 that you can afford. Our review unit came with with a Samsung 512GB SM961 drive, which gave us reads in the 3.4GB/s range and writes in the 1.6GB/s range in Crystal Disk Mark. A final, important design note: Opening the GX501 isn't for the faint of heart. To get inside, you first remove a bottom by unscrewing four screws. You'll then have to remove another 10 or so Torx screws. At this point, we actually chickened out with our disassembly because we were greeted by at least three ribbon cables and the motherboard mounted directly to the bottom plate we had just pulled out. Let's just say serviceability of the GX501 ain't great. This is about as far as you get into the Asus ROG GX501 before you start to scare yourself. Swapping M.2 and RAM won't be a five-minute project. The GX501's port selection is decent. There's a total of four USB 3.0 Type A ports on the each side, plus an analog combo audio jack, full-size HDMI 2.0 and a 40GBps Thunderbolt 3 port, plus a Kensington lock. The right side of the GX501 features two USB 3.0 Type A ports, a Thunderbolt 3, and a Kensington lock port. The left side has two more USB 3.0 Type A ports, HDMI, and analog audio. 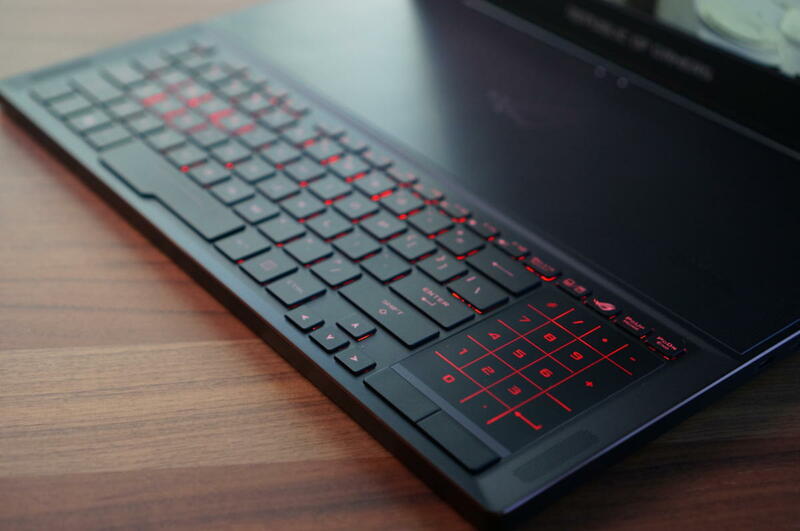 The GX501 features a Chiclet-style keyboard that's a little on the mushy side. The location of the keyboard is sure to cause a stir, as it's been moved to the front of the laptop to make space. Old-timers will recognize this as something all laptops used to do in the 1980s. Asus is aware of the lack of a wrist-rest, so it includes a small one in the box. The lack of per-key lighting, while not a deal-breaker, is a bit of a buzz-kill. In the good column though, this means there's nothing warm under your wrists, and the trackpad to the right of the keyboard offers excellent palm rejection. The trackpad location isn't new, of course. Razer as well as MSI have done this before. As a last-resort method to play games it suffices, but nothing can replace a good mouse. The trackpad also features a virtual 10-key feature that seemed pretty neat initially, but real bean-counters will never use it. To make space, Asus had to shift the keyboard to the front of the laptop. The ROG Zephyrus GX501 is our first chance to see whether Nvidia's Max-Q technology can help this five-pound, super-thin laptop hang with traditionally designed (larger, fatter) gaming laptops. To find out, we ran it through a gauntlet of tests. Our first test is Maxon's Cinebench R15. It's a pure CPU test and loves threads. Generally, we don't expect surprises, and we don't get any from the GX501. 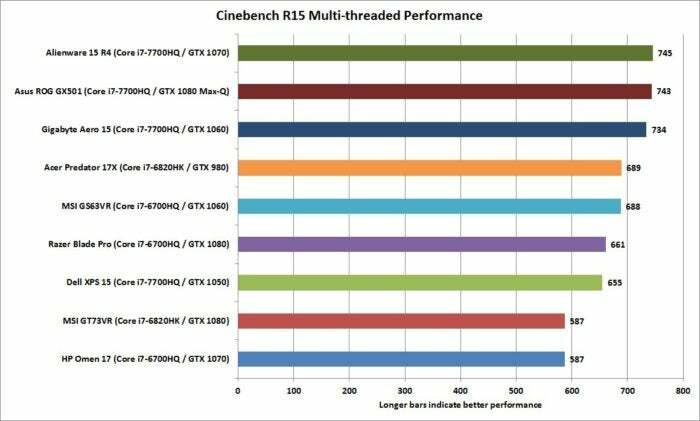 it's pretty much a three-way tie with the four Kaby Lake quad-core chips, which means everything is working as it should. In the much Cinebench R15 test, the Kaby Lake laptops lead except for the Dell XPS 15, which is oddly slightly slower. 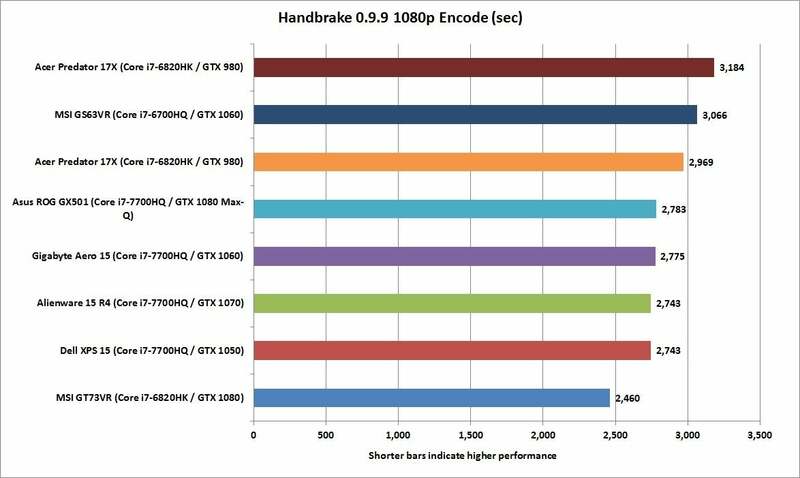 Our second test uses an older version of the free Handbrake encoder and is also mostly focused on CPU performance. Unlike Cinebench R15, which takes less than a minute to render, Handbrake can take about 45 minutes to run on a quad-core CPU. Here we can see that it's pretty much dead-even between all of the Kaby Lake laptops, and the Skylake laptops also cluster up together. The GX501 and it's every bit as fast as the other Kaby Lake laptops on CPU loads. In our encoding test, the ROG Zephyrus GX501 is dead-even with other Intel Kaby Lake-based laptops, giving the Skylake-based laptops a good drubbing. The exception is the massive MSI GT73VR, which leads thanks to an overclocked CPU. No disrespect to the CPU, but the star of this show is the GPU, and I wanted to see how the GX501 and its Max-Q chip does in a pure graphics test. For that, we used Futuremark's older FireStrike Extreme and only broke out the graphics sub-score which ignores CPU performance. 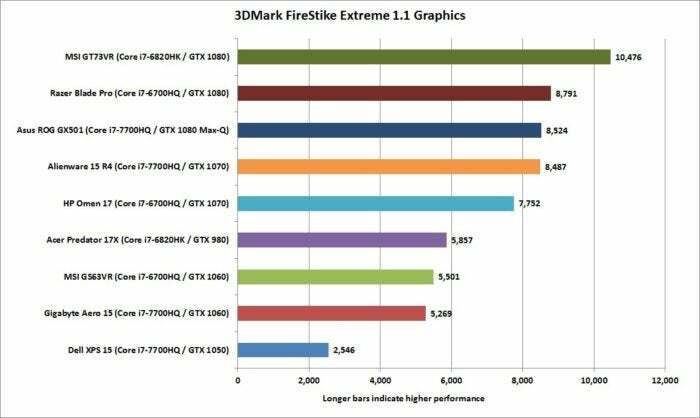 The result is probably the thing that will keep people tossing and turning at night, wondering whether a GeForce GTX 1080 Max-Q is really the equal of a GeForce GTX 1080. In this one test, the answer is No. In fact, the GeForce GTX 1080 Max-Q part actually tracks much closer to the performance of the GeForce GTX 1070 in the Alienware R15 R4 laptop. For what it's worth, that Alienware R15 R4 is fast, noisy, and did we mention fast? 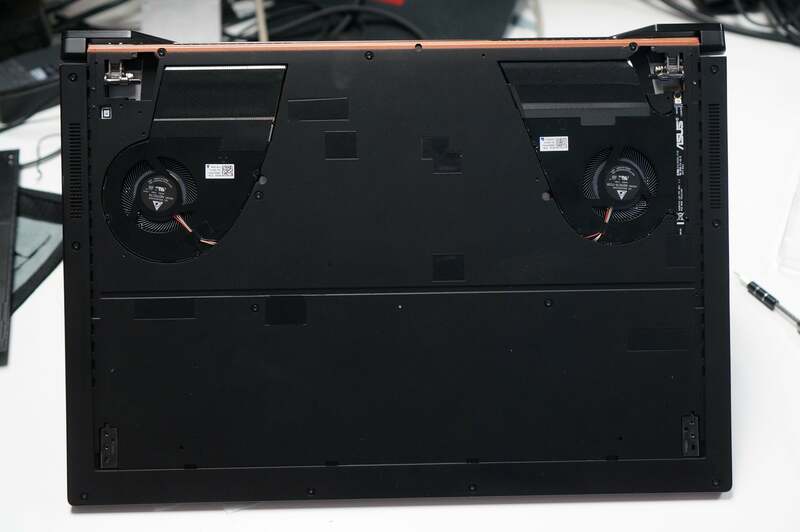 Compare the score of the Alienware R15 R4 to the similarly equipped HP Omen 17 to see just hard Alienware is pushing the parts inside the R15 R4. In the synthetic 3DMark Fire Strike graphics test, you can see that a GTX 1070 pushed hard, like in the Alienware, gives both the Razer Blade Pro and GX501 a tough time. Good against a synthetic benchmark is one thing. Good against a game? The first we spooled up was Rise of the Tomb Raider at 1920x1080 using the Very High default setting. Here the GX501 actually does quite well. On the one hand, it shows what the GTX 1080 Max-Q gives up compared to a GTX 1080 running at full speed. It also, however, does very well against the Razer Blade Pro's GTX 1080, which was tuned down to run in its thinner shell. That advantage the Alienware 15 R4 had in the synthetic benchmarks vanishes because, for the most part, it's running more like the GTX 1070 in the HP Omen 17. 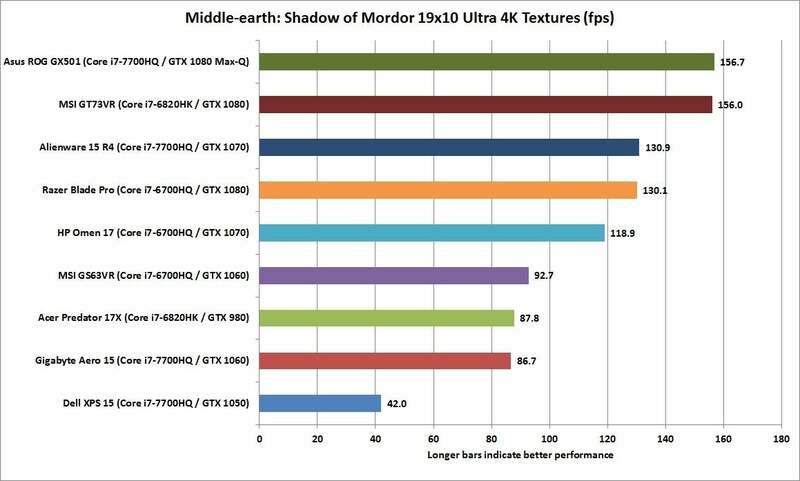 In Middle-earth: Shadow of Mordor, our result shows that yes, in some cases, the GX501 and its GTX 1080 with Max-Q is indeed beastly. The one test where the story got really interesting was Middle-earth: Shadow of Mordor, where the GX501 ran neck-and-neck with the much larger GT73VR. This appears to show that the GX501 and GTX 1080 with Max-Q can run with the big dogs sometimes. If you're wondering what the catch is, it's battery life. When you jam a quad-core CPU and a GTX 1080 into a laptop along with all the hardware to cool it, you're going to give up something. 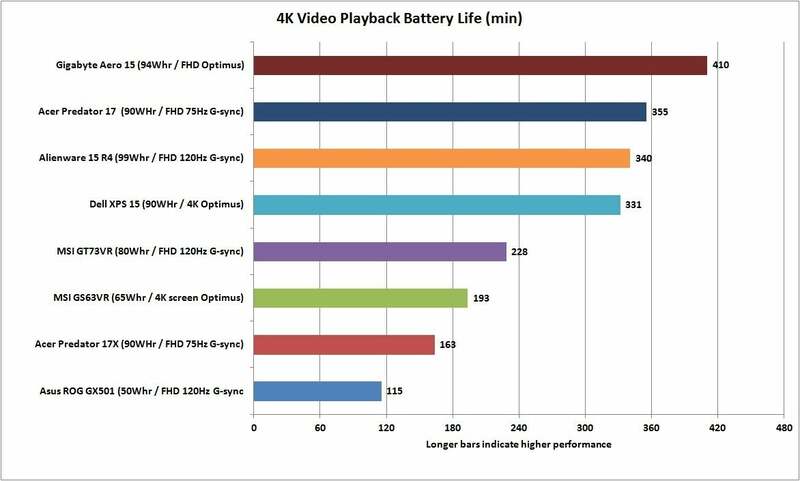 Asus tosses the battery capacity overboard. The GX501's battery is roughly 50 watt-hours. Compare that to the Gigabyte Aero 15, which has a 94-watt-hour battery, and the Dell XPS 15, which has a 97-watt-hour battery. With its GTX 1080 Max-Q, Core i7-7700HQ, and 120Hz G-sync panel, the GX501 has what would probably be fair to call abysmal battery life. We don't really track gaming laptop battery performance that closely, because 99 percent of the time, they're on AC. But for the units we have tested, and laptops in the same orbit as the GX501 (like the Aero 15 and XPS 15), it's just ugly. In fact, it's the worst we've seen from a laptop. Yes, now you understand why you needed to read to the end before making a buying decision. 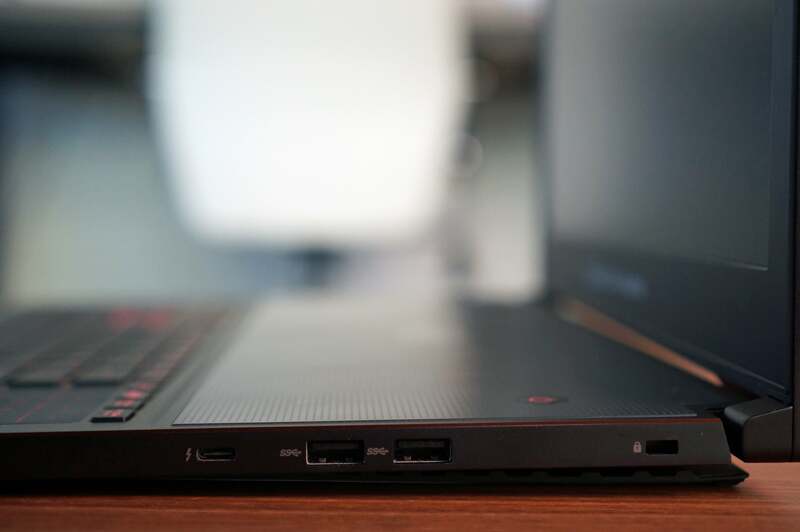 For a laptop with this level of gaming chops, the Gigabyte Aero 15 offers pretty exception battery life for such mundane tasks as watching 4K video. If you're now scratching your head wondering just what is the point of a very powerful, very portable laptop that has dismal battery life, you're probably not alone. But take a step back and hear me out. 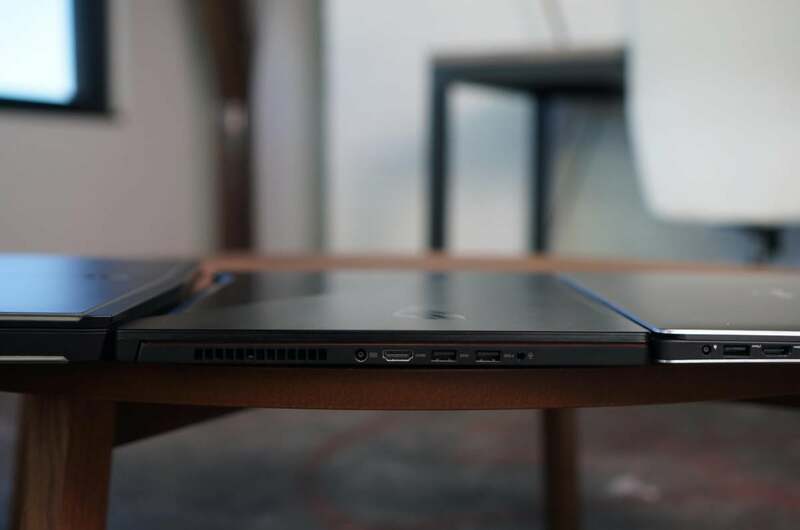 Are there people who want a five-pound, ultra-slim laptop that is sometimes nearly equal to the performance of a laptop that weighs twice as much and is almost three times as thick? Yes. And as much as the battery life stinks on the GX501, the truth is it's horrible on all gaming laptops if you actually play a game. 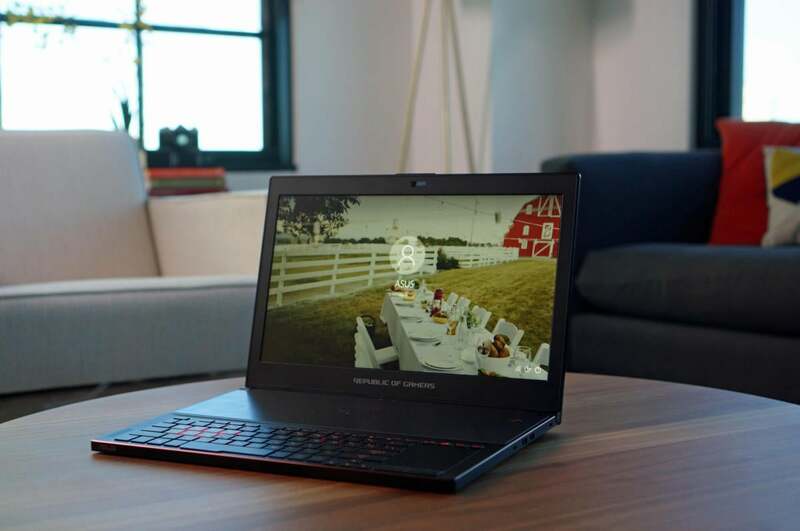 You'd be lucky to get more than an hour and a half playing games on just about every gaming laptop today. You almost have to think of the ROG Zephyrus GX501 as the laptop for those who typically would buy a big, fat gaming laptop because it was the only way to get performance in a semi-portable device. The GX501 lets those folks finally have the performance they crave without the weight and bulk penalty. But let's be absolutely clear: If you're looking for a performance laptop that can be unplugged for most of the day, this isn't it. But, if you're looking for the thinnest, lightest, most powerful gaming laptop and don't give two damns about battery life, it's going to be hard to find something better than the Asus ROG Zephyrus GX501. Correction: A previous version of this story contained charts that had the incorrect GPU information on the GX501. PCWorld regrets the error. The Asus ROG Zephyrus GX501 is the first gaming laptop to achieve a thin and light design as well, thanks to the Nvidia Max-Q technology that comes with its GTX 1080 GPU. There's just one big compromise. GeForce GTX 1080 with Max-Q can yield near-GTX 1080 performance.